(Nanowerk News) The lithium-ion batteries that mobilize our electronic devices need to be improved if they are to power electric vehicles or store electrical energy for the grid. Berkeley Lab researchers looking for a better understanding of liquid electrolyte may have found a pathway forward. 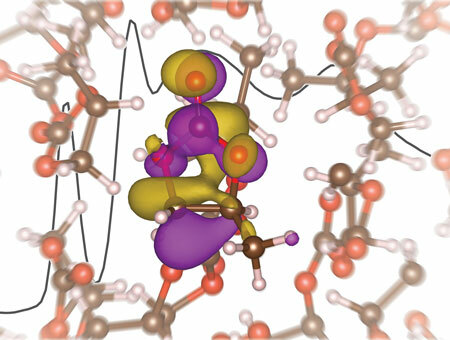 A team led by Richard Saykally, a chemist with Berkeley Lab’s Chemical Sciences Division, David Prendergast, a theorist with Berkeley Lab’s Molecular Foundry, and Steven Harris, a chemist with the Lab’s Materials Sciences Division, found surprising results in the first X-ray absorption spectroscopy study of a model lithium electrolyte ("X-Ray absorption spectroscopy of LiBF4 in propylene carbonate: a model lithium ion battery electrolyte"). Most previous computational simulations have predicted a tetrahedral solvation structure for the lithium ion in the electrolyte, but the new study by Saykally, Prendergast, Harris and their collaborators show this to not be the case. Lithium-ion batteries (LIBs) make any short list of great inventions of the 20th century. Today LIBs represent a multibillion dollar industry as the power supply of cellular phones, tablets, laptops and other handheld electronic devices. However, serious shortcomings – high costs, inadequate energy densities, long recharge times and short cycle-life times – have hampered the use of LIBS for electric vehicles and for efficient electrical energy storage systems that can be used in conjunction with wind and solar energy sources. Although it has become increasingly clear to the battery industry that improvements in the liquid electrolyte are essential if LIBs are to be effective for electric vehicles and large-scale energy storage, most LIB research has focused on the electrodes and solid electrolyte interphase. The problem has been a lack of capabilities for the requisite experiments, particularly X-ray spectroscopy. This deficiency was addressed by Saykally and his group with their development of a unique liquid microjet technology in which two aqueous samples rapidly mix and flow through a finely tipped silica nozzle only a few micrometers in diameter. The resulting liquid beam travels a few centimeters in a vacuum chamber before it is intersected by an X-ray beam then collected and condensed out. This liquid microjet system has been set up at Beamline 8.0.1 of Berkeley Lab’s Advanced Light Source (ALS). Beamline 8.0.1 is a high flux undulator beamline that produces X-ray beams optimized for X-ray spectroscopy. The XAS experimental spectra were interpreted through molecular dynamics and density functional theory spectral simulations carried out on the supercomputers at the National Energy Research Scientific Computing Center (NERSC) by Prendergast and Jacob Smith, a graduate student in Saykally’s research group. The ALS, the Molecular Foundry and NERSC are all DOE Office of Science national user facilities hosted at Berkeley Lab.